(left to right): Sara Wilson, VR Business Development Specialist; Vernelle Gettie, Environmental Services Associate, Aramark; Veronica Woods, Operations Manager, Aramark. As Vernelle entered her 50s, long hours of often back-breaking work began to take its toll. Because of this, and the cold, harsh Detroit winters, Vernelle decided to move back to Ridge Spring, SC to live with her son. She looked for employment but was unsuccessful, even after months of searching. That’s when Vernelle heard about the vocational rehabilitation program and visited the Aiken office. She made a half-hearted attempt to see if VR would work for her, but since living with her son was not working out, she called it quits. However, one year later, she returned to VR with a renewed determination. “I was tired of living that way,” she says. Shortly after committing to get her life on track, Vernelle faced additional adversities that would challenge anyone: homelessness, and the theft of what little money she possessed by someone she trusted. Still, she stayed true to her commitment to make a lifelong, positive change. What was different this time? Vernelle had found a support system through her VR counselor, Latassha Jamison. Jamison listened and came up with a solution to Vernelle’s most pressing need, finding a place to live. Four miles away at Nurture Home, Michelle Harper-Meriwether and her staff provided Vernelle a safe and comfortable place to live. Vernelle moved in and walked to the VR office each day, where she participated in job readiness training (JRT). JRT gave her a routine and purpose each day, valuable training skills, as well as a training stipend. It allowed her to grow her confidence with the support of Jamison and the JRT staff members. While in JRT, Vernelle took pride in her training, giving 110% each day. It wasn’t long before VR staff began to notice, and Vernelle moved from being a consumer to a friend and a welcome addition in the VR offices. Vernelle had a strong history of giving to others, but now found herself to be on the receiving end of generosity and support. Vernelle was beginning to have firm hope for her future. Jamison found Vernelle an employment opportunity by reaching out to Veronica Woods, Operations Manager for Aramark at Aiken Regional Medical Center. Woods was positive about Vernelle’s housekeeping experience, but concerned about the challenges that come with housekeeping in a hospital setting. Jamison suggested a two-week job try-out to ensure that the position was a good fit for Vernelle. VR paid Vernelle a training stipend for two weeks, while she learned the duties required by the position at Aramark. The job try-out was a huge success for both Aramark and Vernelle. 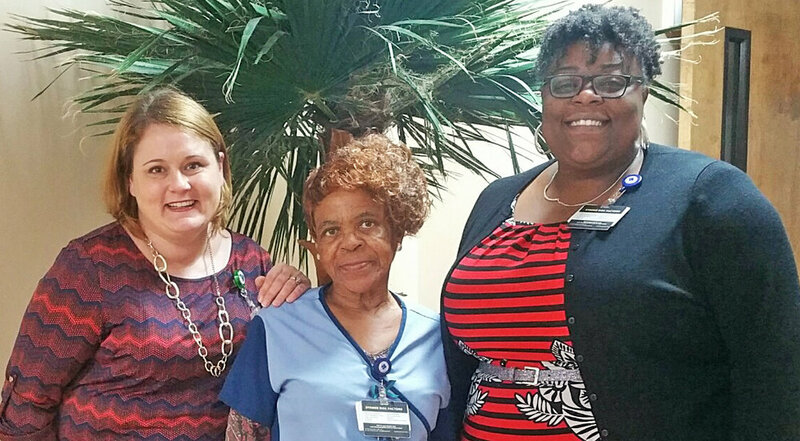 Aramark gained a dedicated, hard-working employee and Vernelle now proudly states that she works for one of Aiken’s most prestigious employers. Woods was so impressed that she now visits Aiken VR regularly to recruit future Aramark employees. Today, as Vernelle walks the four miles each way to and from work, she says she is “walking in glory.” Her experiences since beginning her job have included being the honored guest at a tea party, sharing her story publicly on several occasions, breaking ground for a women’s shelter, and being one of four hospital employees to be invited to have breakfast with the CEO. She is proud of the person she has become. Vernelle’s determination has also opened the doors of opportunity for other VR consumers who are working hard to get back on their feet. And while her hard work has brought her a steady job and the respect of her employers and co-workers, it has another benefit: she will soon host a housewarming party at her new apartment, where many new friends will join in celebrating her success.